For the first time in a decade, the country’s largest single expanse of medieval stained glass is again complete following one of the largest conservation and restoration projects of its kind in Europe. 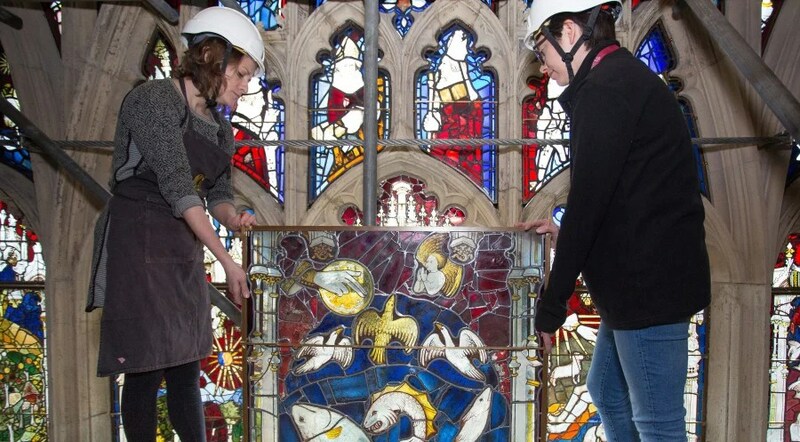 Last piece of 600-year-old stained glass is returned to York Minster’s Great East Window. Image courtesy York Minster. Conservators at the Trust have spent around 92,400 hours meticulously conserving each piece as part of an £11.5m project. The programme has also included extensive work by York Minster’s stonemasons to repair and replace hundreds of stones at the cathedral’s east end, which houses the window. The project has used pioneering technology alongside traditional craft-skills, with the cathedral becoming the first building in the UK to install state-of-the-art, UV resistant external glazing to protect the priceless stained glass. It remains the largest world-wide use to date of the revolutionary protective material. Sarah Brown, Director at York Glaziers Trust, said: “This has been a once in a lifetime project for the team and it’s a huge privilege to be part of this milestone in the Minster’s history. The Dean of York, The Very Reverend Vivienne Faull, added: “It’s a triumph to have the Great East Window complete once again and we look forward to seeing it in all its glory when the scaffolding is removed and the project formally completed in the spring. “Its completion marks the start of a multi-million pound campaign in partnership with the York Minster Fund and the Heritage Lottery Fund (HLF) to provide state-of-the-art protective glazing to all 128 of our medieval stained glass windows. The window was created between 1405 and 1408 by Master Glazier John Thornton, who was paid £56 by the Chapter of York. As the cost of materials and the wages for the other craftsmen involved in making the window under Thornton’s direction is unrecorded, the overall cost of the window is unknown. It is however a work of enormous ambition, depicting the beginning and end of all things from the book of Genesis to the book of Revelation, known in the Middle Ages as the Apocalypse. Work to restore the window originally started in 2005, when the east end and Great East Window were covered in 16 miles of scaffolding so stonemasons and conservators could assess the condition of the 14th century stonework. Centuries of exposure to the elements had left the stone so badly weathered that the window had begun to bow. The size of the task prompted a bid to the Heritage Lottery Fund, which in turn led to York Minster Revealed – a five year, £18m project generously supported by a £9m grant from the Heritage Lottery Fund, matched by funding from the York Minster Fund and the Chapter of York. Due to the size of the project the work to return the stained glass to the window has been done in two phases. In 2015, 157 stained glass panels were returned to the Apocalypse and Tracery sections of the window as part of the five-year York Minster Revealed project, which concluded in March 2016. Between August 2015 and September 2017 the final 154 panels from the Tracery and Old Testament sections were worked on in the Trust’s studios before being returned to the window between November 2017 and January 2018. Over the next few months, the scaffolding will be removed followed by a period of extensive cleaning, before a celebration to formally mark the completion of the project in May. The Lady Chapel, which is at the foot of the Great East Window, will then once again be used for worship.